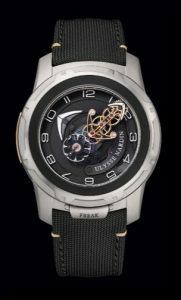 Titanium, 45mm case, with a 7 Day power reserve, Flying Tourbillon, manual wind movement. The rose gold accents with the black background allow the dial to stand out beautifully! It is available on a matching black color sail cloth strap, with a titanium folding buckle.